It appears that the surge of distressed property that entered the market in August of last year will be replicated in 2014, as the short-term trend of short sale and foreclosure listings is moving higher. A conspiracy theorist might conclude that the large lenders holding the most distressed property inventory have withheld the bulk of their REO assets during the peak summer months in order to help real estate values recover, but I suspect they aren't that organized. 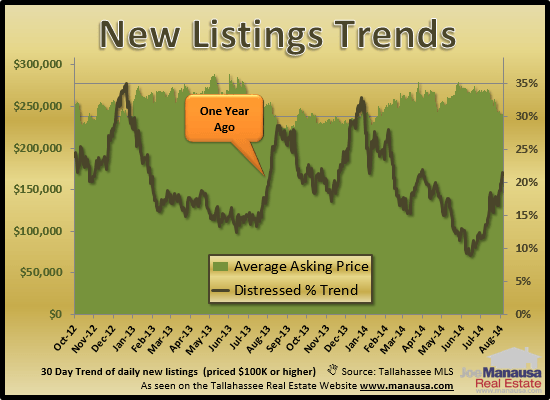 Take a look at the again-changing landscape for homebuyers and sellers alike, as more than 1 in every 5 new listings in the Tallahassee MLS is being marketed as "distressed." 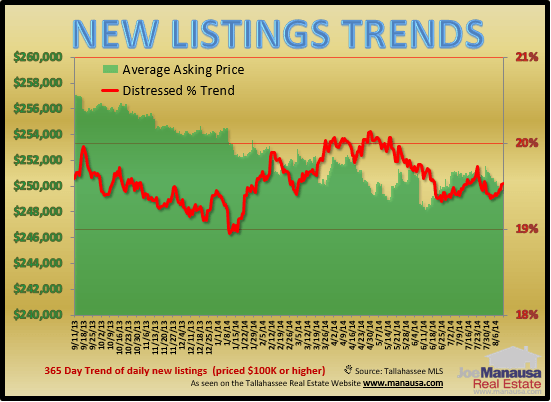 Our first real estate graph measures the short term trend of new distressed properties listed for sale in Tallahassee. The vertical green bars measured the average asking price for new listings over the past 30 days (left vertical axis), while the brown bar tracks the average ratio of distressed property listings compared with all new listings in Tallahassee (right vertical axis). Note how the ratio of distressed property listings is soaring higher, just as it did a year ago. Is this an organized effort by the banks to control the flow of foreclosures into the market, or is it rather a simple mathematical result that occurs as arms-length sellers begin the seasonal slowing as the school year approaches (meaning the bulk of "normal" listings occur from March through June). I suspect the latter is what we are really seeing. When we shift from a 30 day trend to a longer one, we can see that the state of the Tallahassee real estate market has not changed much over the past year. The following graph shows the one-year trend of average list prices and the ratio of distressed property to the total market. I find it interesting that the percentage of listings being marketed as distressed properties has remained between 19% and 20% since September of last year. This graph showing one-year averages removes the seasonality that occurs throughout the year, and the only trend that we can truly spot over the long-haul is that the average asking price has come down a little over 2% over the past 11 months. The really isn't any evidence of distressed properties going away, and I think we will continue to see a significant number of foreclosures in the Tallahassee real estate market for many more years. The following list shows the most recent distressed properties put on the market in Tallahassee (priced over $100K). I hope you gained a better understanding of what is being listed for sale in Tallahassee. If you are planning on selling your home, let us help you analyze the market and decide upon your smartest entry point. And if you are interested in buying a distressed property in Tallahassee, just drop me a note and we can schedule a time to help you acquire the right one at the right price, using our proprietary home buying process.